Do You Have Jaw Pain in Helotes? Get Help from a Dentist! If someone mentions a dental issue, you probably think of cavities or gum disease. These issues can be uncomfortable and unfortunately too common among American adults. However, what you may not realize is that other types of dental pain that are just as common, like orofacial pain. If you’re experiencing jaw pain in Helotes, this post is for you! What Can Cause Orofacial Pain? Temporomandibular joints are triangle-shaped joints made of muscle and cartilage that sit on either side of your face, just in front of your ears. These joints act as hinges that help your mouth open and close. It can be truly painful and inconvenient when these don’t function properly. Without properly functioning TMJ’s, we cannot function properly enough to eat and speak. A toothache or tooth pain is most often caused when the nerve to a tooth is irritated. There are a few different reasons why a patient may experience orofacial pain from toothaches. 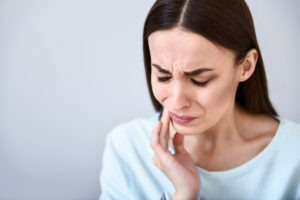 Risk factors for toothache include dental infection, gum disease, plaque, dental decay, injury, cracked teeth, poorly placed fillings or crowns, failing or leaking fillings or crowns, loss of a tooth (including tooth extractions), temporomandibular joint (TMJ) disorders, and obstructive sleep apnea. With this extensive list, patients may ask what doesn’t cause orofacial pain. If you have gone through treatment for pain and still experience symptoms, you could have a sleep order causing your orofacial pain. Teeth grinding, or bruxism, happens when sleeping if patients are stressed. Or, you could have sleep apnea, causing the tissues and muscles in the back of the throat close off the airway. There are many different symptoms that are associated with sleep apnea, including orofacial pain. When you have orofacial pain that just won’t quit, don’t ignore it in hopes that it disappears one day. Your dentist can perform a complete exam and consult with you about the best course of treatment to correct your dental problem. If you have orofacial pain, don’t wait! Contact your local dentist today. At Alamo Springs Dental, our goal is to provide a place where you can feel comfortable discussing your dental issues. This way, Dr. Aiyana Anderson and Dr. Michele Moreno can help you revitalize your oral health with our comprehensive treatments and services. If you would like to schedule an appointment to meet with either of our expert dentists to discuss your orofacial pain in Helotes, feel free to call our office. Comments Off on Do You Have Jaw Pain in Helotes? Get Help from a Dentist!